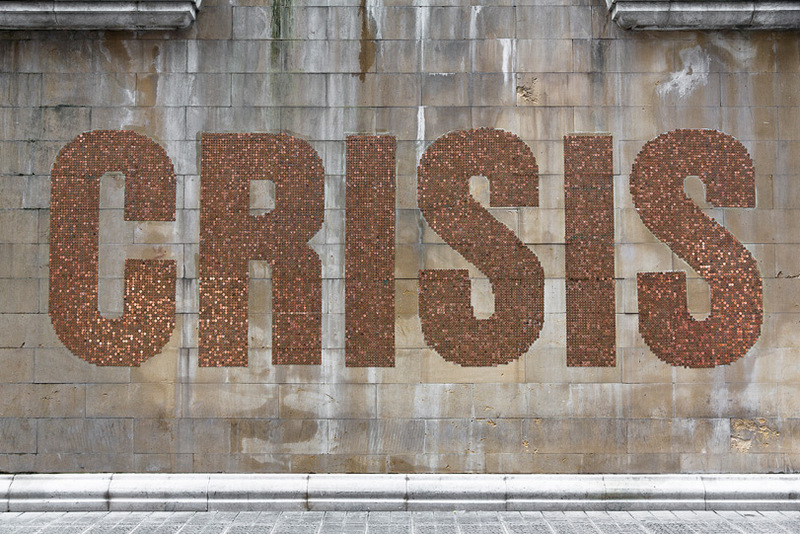 Word “Crisis” created with 1000€ in coins of 2 cents. The installation took place in a centric neighborhood in the city of Bilbao. All the coins disappeared in less than 24 hours. A visual piece that makes a pretty clever use of the raw material. In fact it is this point which pushes the piece to the next dimension. Coins that are shaped as a word in order to talk about money, economics and political contexts. The, expected or unexpected, interaction with passer by pedestrians does infuse the overall work and extra layer of reflection and intellectual enjoyment. Tags: accessible art, art in public space, art installation, crisis, economy, participation, politics, social discussion, social voice. Bookmark the permalink. Previous post ← Waiting for climate change.